A core mission of the event is to demonstrate, investigate and discuss how professionals and policymakers are utilizing and implementing Passive House today – from fully certified buildings, to rethinking how they approach their work, utilizing Passive House methodologies, to make critical climate impacts. University Dormitory in Australia: Mass Timber Certified Passive House: A 70,000 SF university dormitory in Melbourne Australia of CLT construction – presented by the architect and owner. University Medical Research and Education Building: Certified Passive House: The 140,000 SF George Davies Centre at the University of Leicester in the UK, which accommodates 2,400 occupants, theaters, research laboratories and teaching spaces. The New Office Building Amenity: Elegant Passive House Retrofit: 150,000 SF office building retrofit in Brussels – making a modern workplace while salvaging the existing structure and repurposing removed materials. 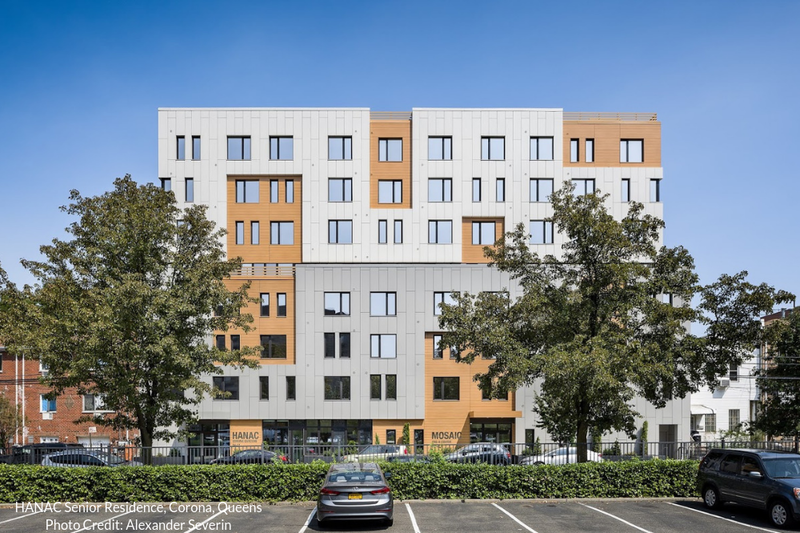 Passive House Affordable Senior Multifamily in Queens: A 58,000 SF mixed-use, affordable housing building in Corona, Queens. Clear Targets: Good Direction: Presentation and policy discussion about actions in California, British Columbia and New York, including policymakers from the three jurisdictions and many other jurisdictions as well. Embodied Carbon: What You Don’t Know Can Hurt You: A deep dive into the upfront carbon emissions that can significantly negate the benefits of energy efficiency in our quest to reach 2050 climate goals. RetrofitNY: NY State Enabling Multifamily Market Transformation: A look at the progress of this transformative NYSERDA program, the origins, project examples and what’s next. NAPHN Conference attendees include the full spectrum of building industry professionals, including architects, engineers, owners, labor groups, educators, policymakers, students and high performance building enthusiasts. This national conference is noted for attracting global practitioners pushing the boundaries of Passive House building development, particularly in tall and large buildings. Workshops, Tours & Expo: In addition to the regular program, a series of pre-conference workshops will offer a deeper dive for practitioners seeking to master select specialty topics. The conference program is further enhanced by a curated expo featuring vendors of products suitable for Passive House buildings. Participants may also choose from a selection of tours, where they may visit completed and in progress projects by those already Building the World We Want. This entry was posted in Featured, Recent News and tagged naphn19 conference building efficiency, Passive House.